A middle-management employee of a pharmaceutical company who is in the midst of a personal crisis gets caught in the middle of a conflict between his bosses and the Mexican drug cartel over the formula for a marijuana pill. Marijuana gummy bears, pot brownies, cannabis candies, dope vape fluid, and herb soft drinks (among other things) already exist in the world, so we can't possibly imagine that the formula for a weed pill would be all that valuable. 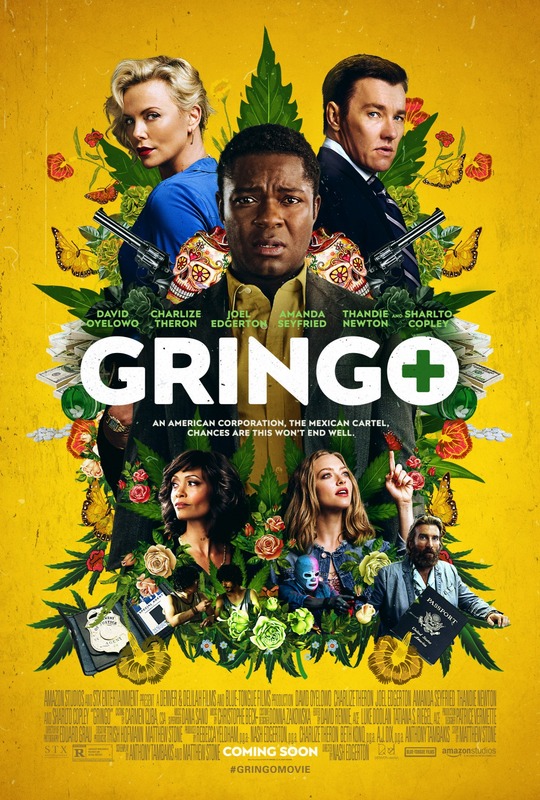 "Gringo" is directed by Nash Edgerton, who has mostly directed short films and music videos up to this point. The screenplay was written by Anthony Tambakis, who wrote the excellent film "Warrior" and the not-so-excellent movie "Jane Got a Gun." It is co-written by Matthew Stone, no, not the co-creator of "South Park," but the writer of "Big Trouble," "Man of the House," and "Soul Men." It stars David Oyelowo as human doormat Harold Soyinka, who has recently learned that he is about to be bankrupt and will likely lose his job due to an upcoming merger with his firm. Harold has also just discovered his wife has been unfaithful. He works for a pharmaceutical company that has developed a weed pill called Cannabax. He and his bosses Richard (Joel Edgerton) and Elaine (Charlize Theron) are heading down to Mexico to check up on the operation. Unbeknownst to Harold, Richard and Elaine have been supplying the Mexican cartel with marijuana. When they try to cut the cartel off and Harold disappears, they start to worry that their upcoming merger is in serious jeopardy. "Gringo" is an all over the place action crime dark comedy. The marketing for this movie played up the crazy comedy misadventures of marijuana angle, but unfortunately, the film isn't all that funny. This is not to say it is entirely devoid of humor because every so often, an occasional joke lands properly. We laughed a couple of times here and there, but it's not side-splittingly hilarious like we hoped it would be. The biggest problem with "Gringo" has to do with the characters, particularly Richard and Elaine, who are wholly unlikable in every manner of speaking. Nothing they do comes across as darkly humorous and their actions are only ever perceived as crass and full of dickishness. The story has a lot of threads and they don't exactly come together all that well. There is a storyline for Richard and Elaine, one for Harold and his problems, one for the ongoing threat from the cartel, one for a storyline featuring a random couple named Sunny and Miles (Amanda Seyfried and Harry Treadway) who are constantly running into Harold in Mexico, and lastly, the thread about a mercenary name Mitch (Sharlto Copley). It never feels like these stories are fully in sync. In fact, half of these plots feel like they are in a different movie entirely. One or two of these portions could have easily been cut out and the movie would have been a lot more clear and a lot more concise. Because of these extra threads, "Gringo" is just way too long and moves very slowly to its obvious conclusion. Luckily, we do like David Oyelowo even though he plays a total pushover, and Sharlto Copley is always good in everything when he gets to play a to-type oddball character. Honestly, this movie would have been a lot more successful if Copely and Oyelowo were the only two characters prominently featured. While there are a couple of fun, entertaining moments of action-packed craziness, most of the time, the story being told in "Gringo" drags on and on with no end in sight. It feels aimlessly zany, and what we're left with when the dust settles is a mixed bag that winds up a bit more bad than good, plus two or three too many animal metaphors.